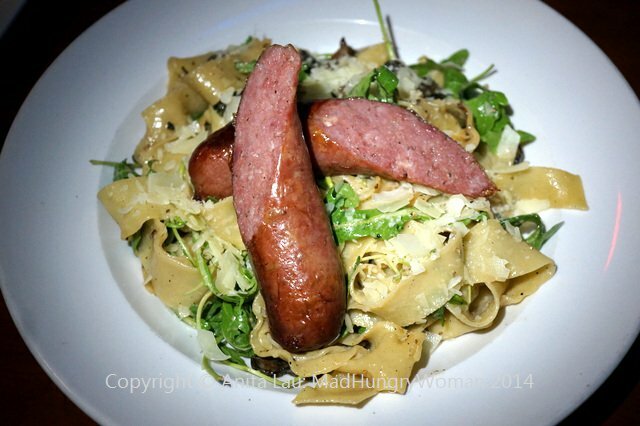 I’ve had Dublin 4 Gastropub bookmarked for a really long time. Too long. Therefore, I was so pleased when a fellow foodie — who absolutely adores this place — agreed to have lunch with me here. Those of you who don’t know how the name “Dublin 4” came about will be interested to know that it is actually a postal code (similar to our zip codes) and services an area which houses University College Dublin, as well as several foreign embassies. In current culture, “Dublin 4” or “D4” is used to represent the more affluent lifestyles of the residents in that area. So with that out of the way, I am excited by the menu, as there are so many things I’m eager to try. I consult my friend who has dined here numerous times on our menu for the day. 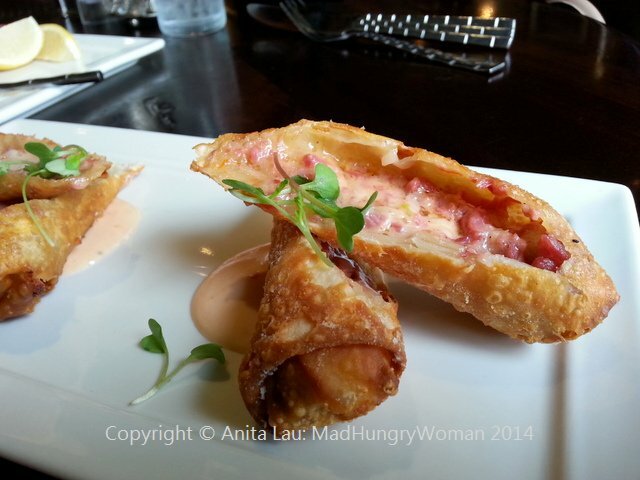 So many things piqued our interest so we decided to order as many we were able to put away starting with D4 Reuben Rolls ($13), egg rolls stuffed with house cured corned beef, house-made sauerkraut and Blarney Irish cheddar. I wasn’t sure I would enjoy these but I was wrong. They were absolutely delicious. 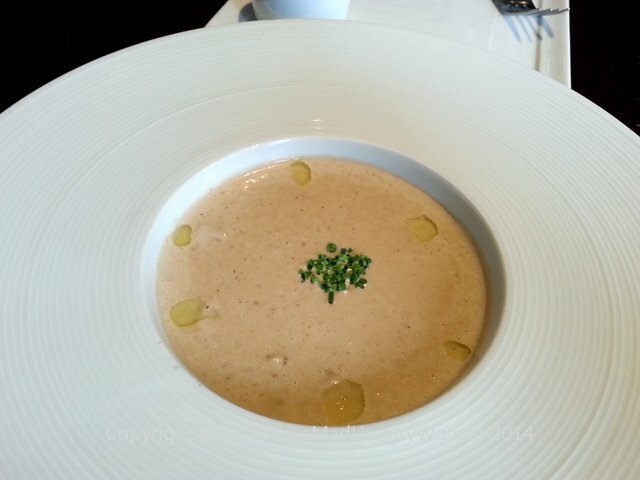 D4 Seasonal Soup Selection ($9) was mushroom bisque and it was delightful. 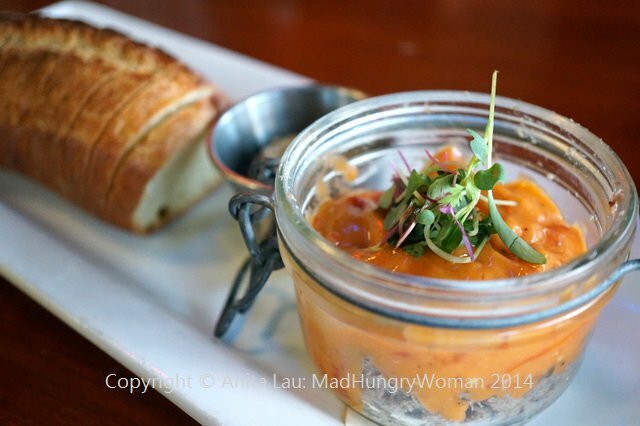 Earthy and so umami-filled, each spoonful was relished with pleasure. 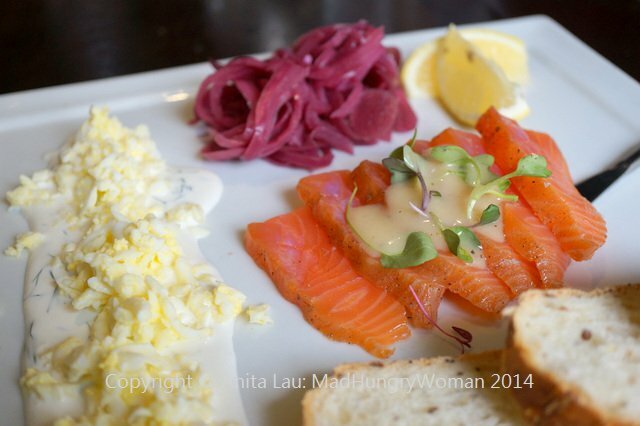 I love smoked salmon and the House-Cured Smoked Irish Salmon ($16) caught my eye. It was even better than I had expected. Succulent slices of luscious salmon were served with dill creme fraiche, chopped egg, pickled onions, and slices of rustic wheat baguette. I didn’t need any of the accoutrements because the fish was incredible on its own. I wanted to try a sandwich and the lamb burger was a highly recommended suggestion, however, I wasn’t in the mood for a burger, so we selected Niman Ranch Pork Belly BLT ($16). 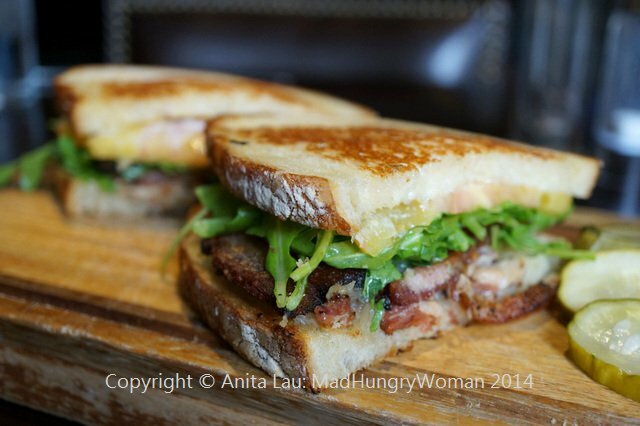 Thick slices of pork belly, wild arugula and heirloom tomato were topped with house-made sweet onion and bacon marmalade. The flavor profiles were great, but the bread was a tad soft bordering on mushy — maybe toasting it a little longer would help. 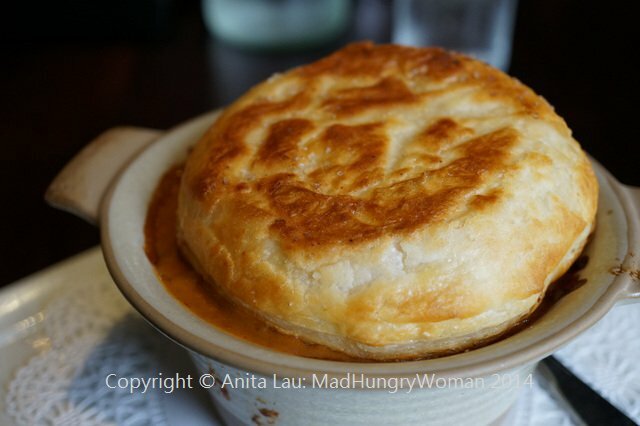 I had heard so many great things about the Dublin Lawyer Lobster Pie ($21) and I was glad it was a lot smaller than I had initially expected. Chunks of Maine lobster are bathed in a cognac cream sauce dotted with fresh shucked peas. The pastry is nice and flaky while the filling is perfectly seasoned with the right consistency — not too thick and not watery. Well worth the price! 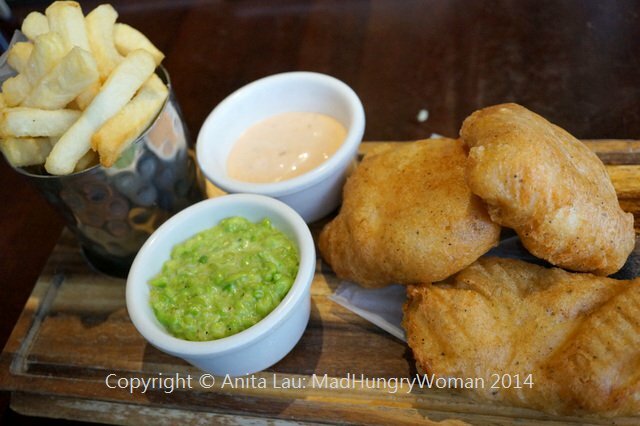 Fish & Chips ($20) is always a favorite of mine, but few restaurants do it well. The one here is good, but not perfect. The fresh Norwegian cod is incredible, flavorful and moist. The Avery White Rascal beer batter was too greasy and caused the bottom of the fish sitting on the plate to be wet and soggy. The crushed garden peas was absolutely stunning, I wonder if they offer it as a side. This little unassuming spot is a definite winner, offering hearty and comforting food that will surely appeal to all. Its location is convenient, located right off the freeway. I will be back! 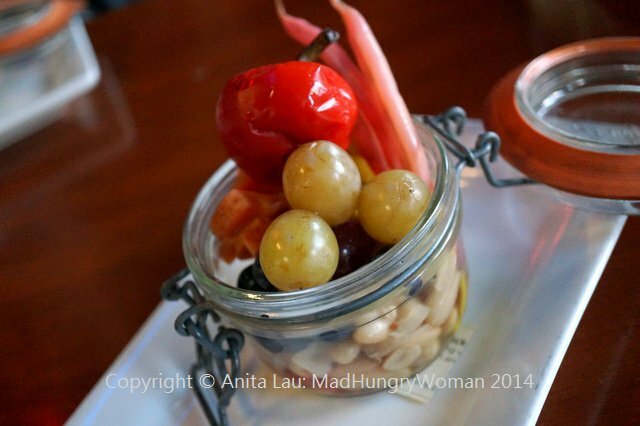 The second of three Australian restaurants I’m featuring from my trip is Gerard’s Bar. I came here with my university friends for a night out hoping to get a table at Gerard’s Bistro, but unfortunately, on a Thursday night, they were fully booked and there was not a chance for them to fit us in. So, we walked across the courtyard in the back and ventured towards Gerard’s Bar, part of the Bistro, but with its own menu. 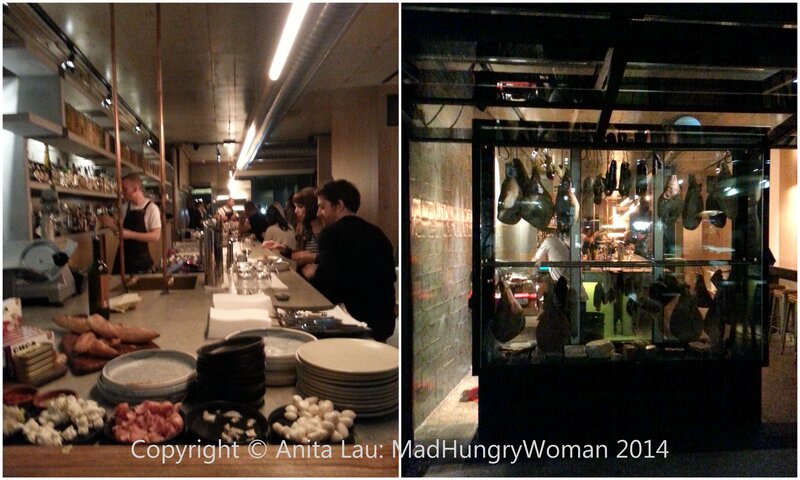 It is a gastropub of sorts with charcuterie hanging off hooks displayed in the window. It is extremely dark inside and not a seat available, luckily, we were able to find al fresco seating out on the patio. I started with The Quiet Mexican (AUD14/$13) which made me chuckle because I don’t think I’ve ever met a quiet Mexican before. 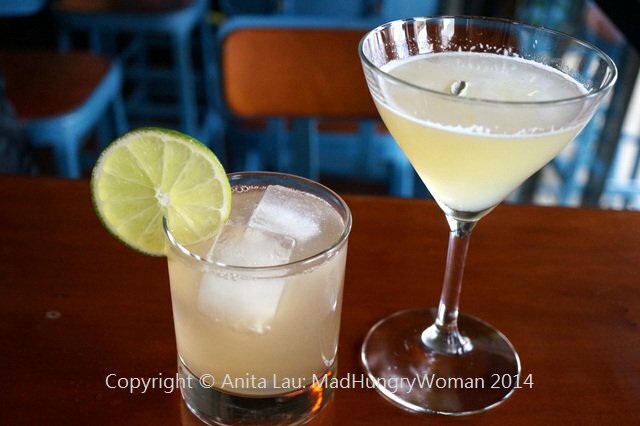 The cocktail was pleasant using tequila as its base. I chose this not only because I love tequila, but most of the menu comprised of absinthe or aperol — both of which I dislike. The charcuterie is extensive and impressive. 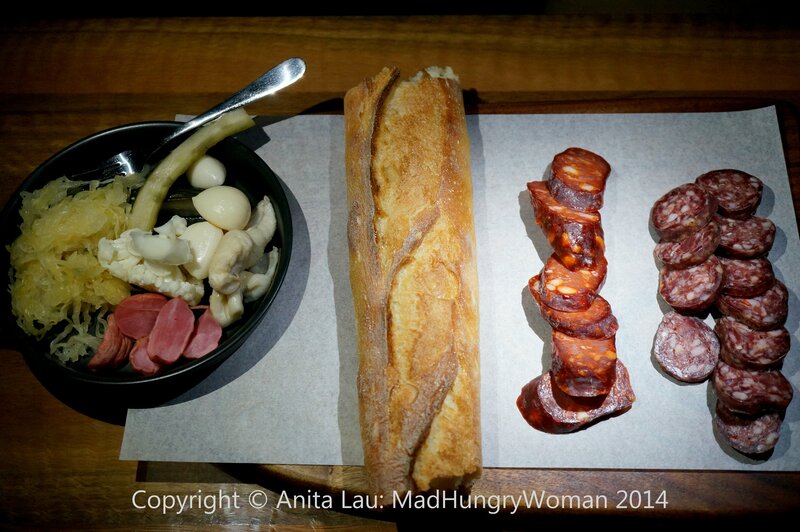 I had ordered Guanciale (AUD8/$7.40) salumi Australia, a pepper cured pork jowl and Longanisa Roja (AUD9/$8.35) a course ground salumi described as possessing spiced with pepper and garlic and Moorish accents, although I didn’t really detect much of the latter. Served with a baguette — not crusty — it was a nice vehicle for the meats. A plate of pickled vegetables accompanied, but I was perplexed by the lack of tartness and the abundance of saltiness from each of the items. 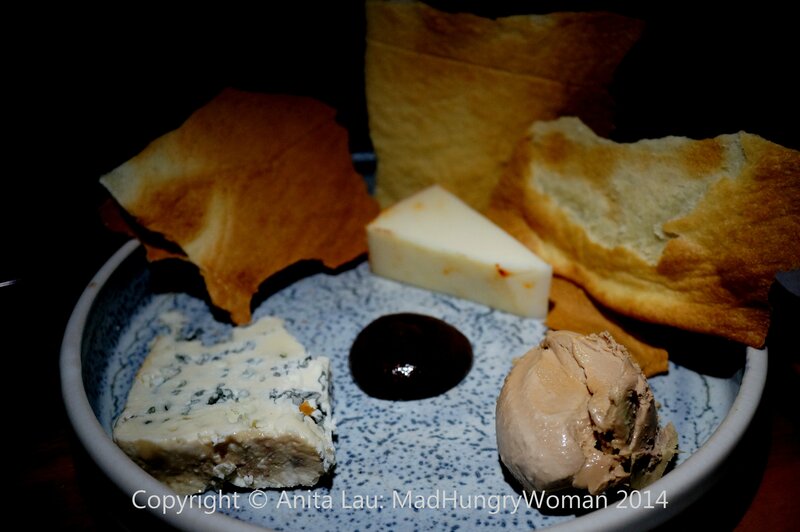 The thing which won me over was Quail Liver and PX Parfait (AUD16/$14.85) a creamy liver mousse which was light as air. Plated with it were the two cheeses I selected, one of which was Grandvewe Sappire Sheep’s Blue (AUD7/$6.50), the other was Cabra Pimenton (AUD6/$5.60) was possibly my favorite with lovely hints of peppers.. Crispy flatbread adds a nice component and good contrast to the baguette. 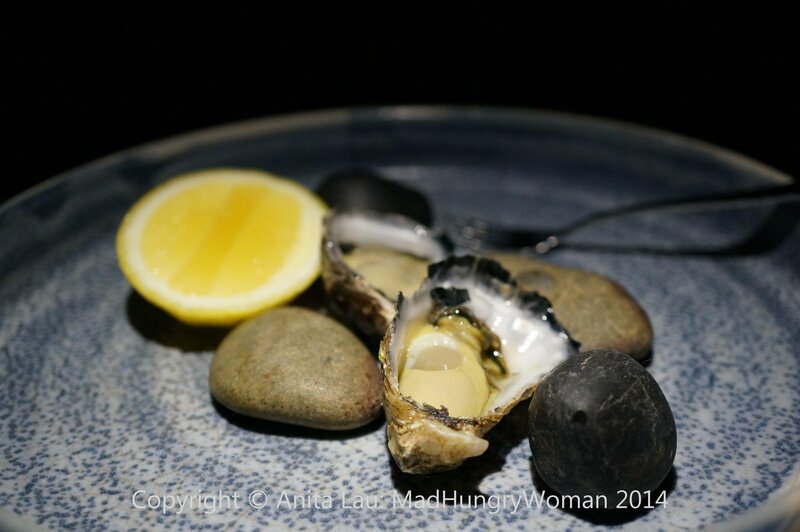 Since I’m not able to partake in the Moonlight Flat Oysters (AUD5 each/$4.65) I can only attest to the oohs coming from my son’s lips when he ate these. One of my favorites of the night is Storm Clams and N’Duja (AUD9 each/$8.35). 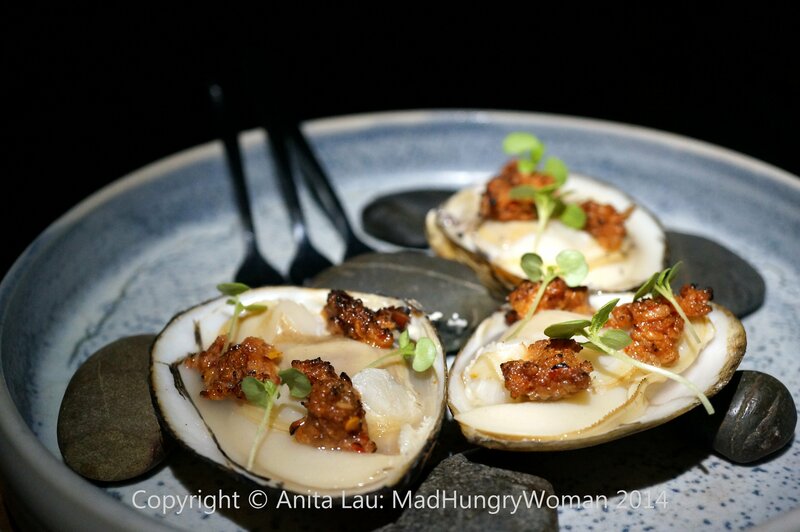 These large clams are flame grilled topped with spicy n’duja and fresh lemon. They are meaty and umami-filled that I wish I had ordered more. 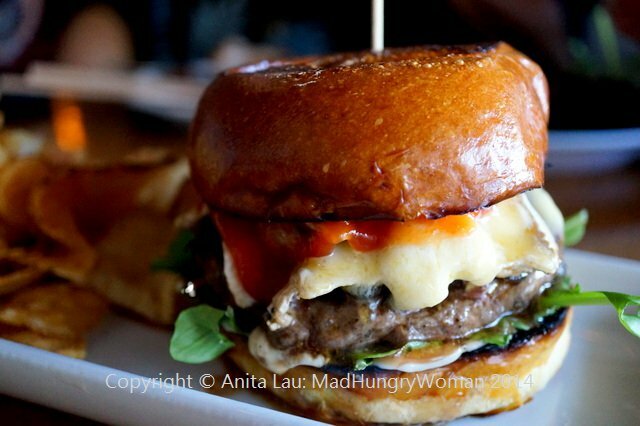 The Cheeseburger (AUD14/$13) is a double wagyu beef pattie burger topped with bacon, relish, pickles and cheese. 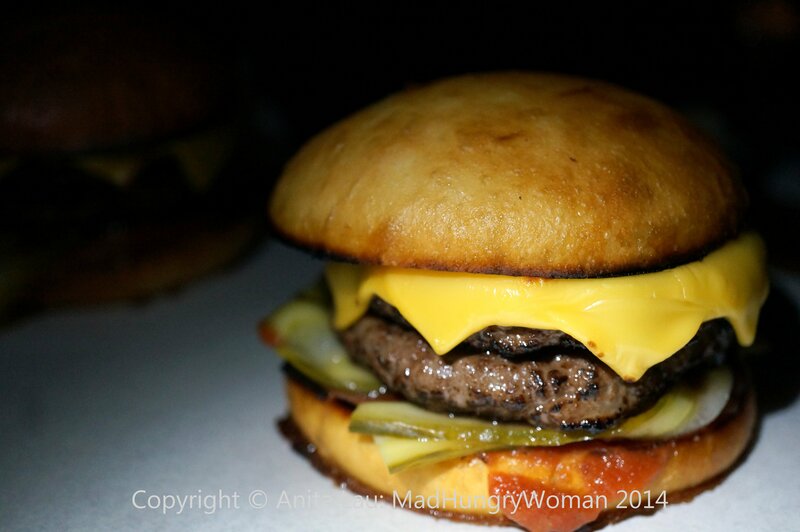 The bun was a tad dense, but overall, the flavors were perfect. The patties were packed with flavor and seasoned well. Even though it looked small, it was a satisfactory item even if you were only having it as your meal. Mulloway Tartare (AUD10/$9.30) was a display of innovation. 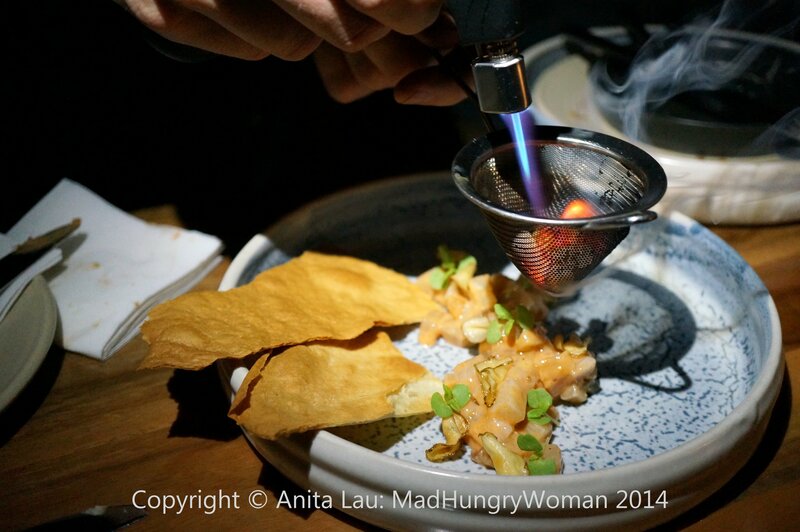 Bits of smoked lardo are placed in a sieve and held over the plate of diced mulloway (jewfish), Jerusalem artichoke chips, kimchi and shiso. A blow torch starts flaming the lardo, melting it away, allowing the unctuous pork fat drippings to drape over the fish tartare concoction. Beautiful presentation and a nice gimmicky interaction to have with the customers. 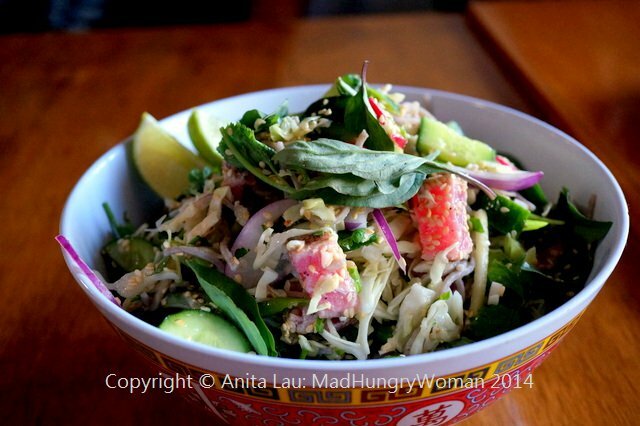 If you’re ever in Brisbane, Queensland, take some time to check out the blossoming food scene. I was delighted to find all these new restaurants offering a level of sophistication I had not previously experienced in this town. I hope it keeps continuing in this direction. If the name Frank De Loach has never crossed your ears before, you’re definitely missing out. This is an unconventional chef who thinks outside of the box, one who is not afraid to play with flavors and bring together ingredients some may not be familiar with. In short, not everyone get his food. But for those who do, the experience is a sensational one. Chef Frank’s flavor profiles are pretty much on par with mine about 99% of the time. I know he will use enough salt and acid for my palate and that is always something to be happy about. When you meet Chef Frank, you won’t be surprised that his gastropub-style cuisine is deliciously comforting, however, it is his Asian-inspired dishes that blows my mind. 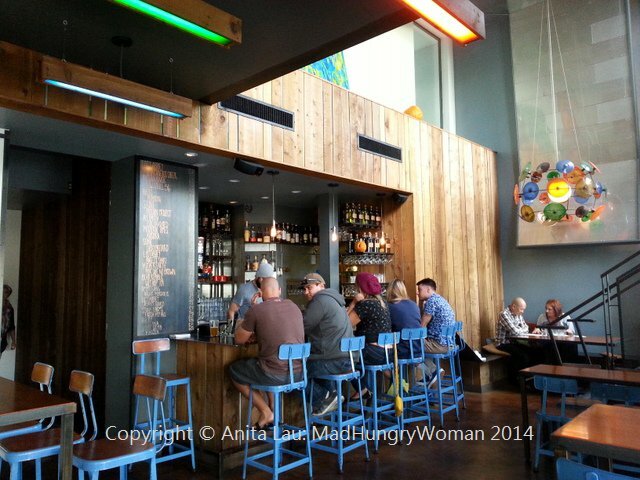 My first experience with Chef Frank’s Asian-style food creations was at Early Bird in Fullerton. His love for Asian flavors, plus the myriad of tastes he picked up during his travels to southeast Asia invigorated him to design — and they are often works of art — incredible pairings of flavors he was moved by. 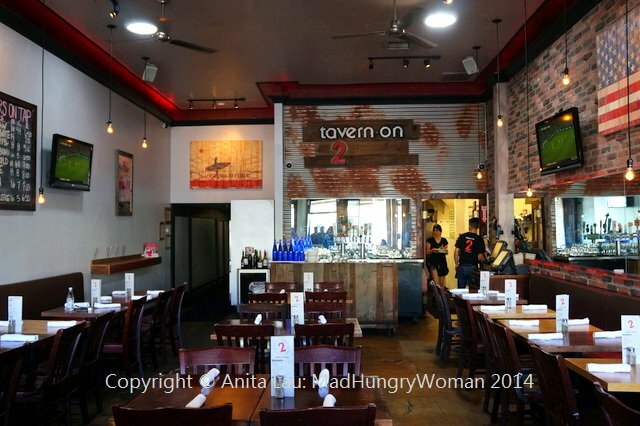 Chef Frank is now at Tavern on 2 in Long Beach, where most of the customers order the burgers. We had one as well — Tavern Burger ($14). The pattie is a perfect medium rare. 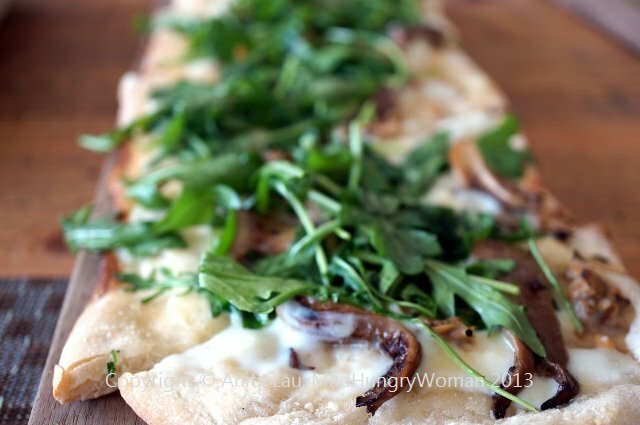 Each bite provided me with a hint of sweetness from the caramelized onions, richness from the St Andre brie and freshness from the arugula. The savory ketchup did a great job by adding some salty tart finish. The burger is good. Damn good. It is not surprising that about 70% of the restaurant had one on the table — there are four beef burgers, one ahi and one veggie on the menu. 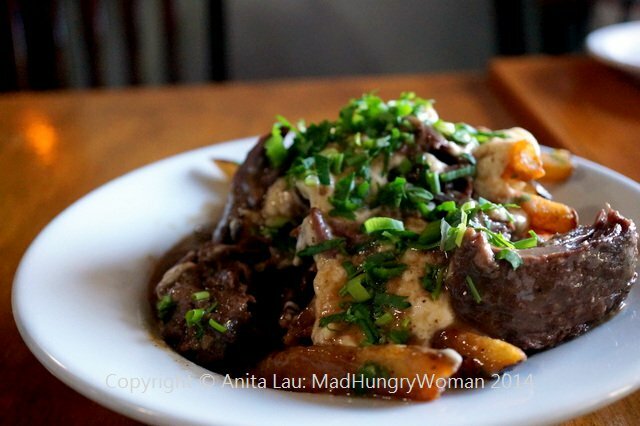 Another favorite is Chef Frank’s version of Short Rib Poutine ($14). Yes, there are those who are sticklers for authentic poutine, and then, there are those who haven’t a clue what real poutine is. I kind of fall in between. I’ll love it if it tastes good. 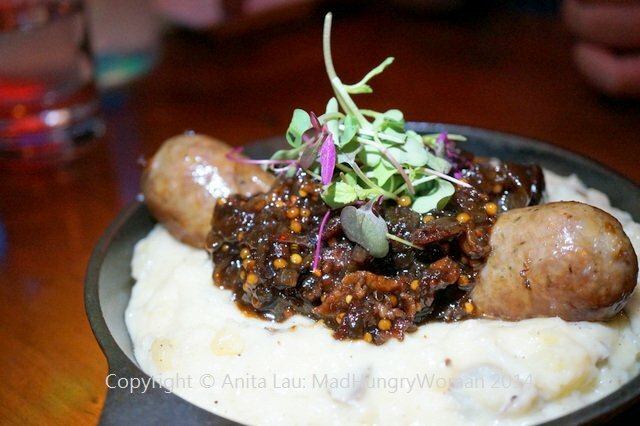 The version here has braised short rib which would probably amass a complete furor from some. Ask for it with only gravy and Wisconsin cheese curds if you feel your purist side emerging — I eat it without much short rib and prefer only gravy and curds with my fries. It is definitely very tasty. 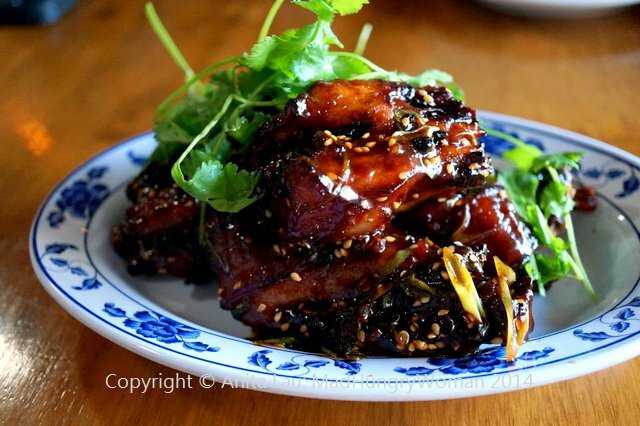 Don’t grimace at this next dish, Sticky Pigtails ($9), if you like ribs, you’ll most probably like this. The minute I bite into it, a wave of nostalgia comes over me. The sauce tastes exactly like my mother’s sweet and sour ribs except she uses Chinese dark vinegar. Here, it is a blend of hoisin and oyster sauces with lime and a few other things thrown in. Sticky they definitely are, and mouthpuckering as well, but it’s all good. Hamachi Crudo ($12) is another blackboard special and is so simple and refreshing. 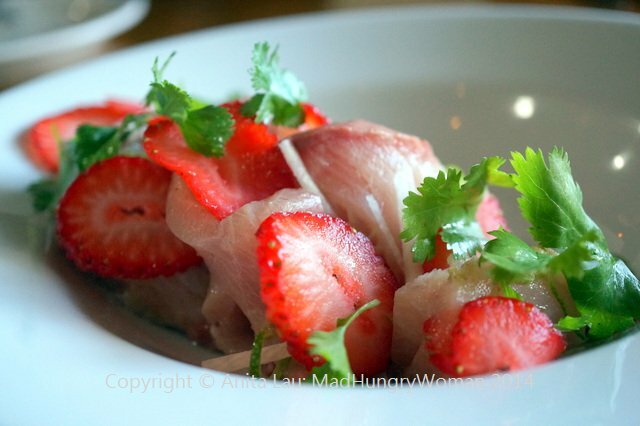 Interspersed between slices of strawberries, jicama sticks, cilantro and shards of lime zest, the fish possesses hints of the jalapeno vin it is marinated in. Subtle and not overpowering, the hamachi is left to shine. Naturally, I wanted just a little more citrus, but that’s just me. If I am dining alone, the Seared Ahi Tuna ($16) salad would make for a perfect dish for one. 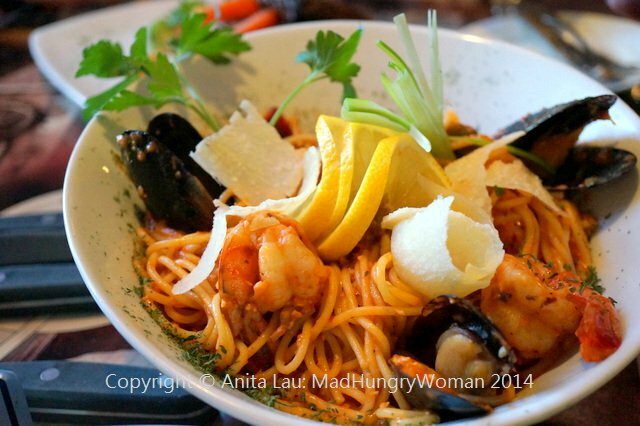 If you’re there with others, you can share it — unless you’re with me, then I would hog the entire bowl. Chunks of seared ahi tuna is tossed in a Vietnamese dressing along with soba noodles, Thai basil, cilantro, radish, cucumber, red onions, cabbage and scallions. This is one of those items I am not able to stop eating. 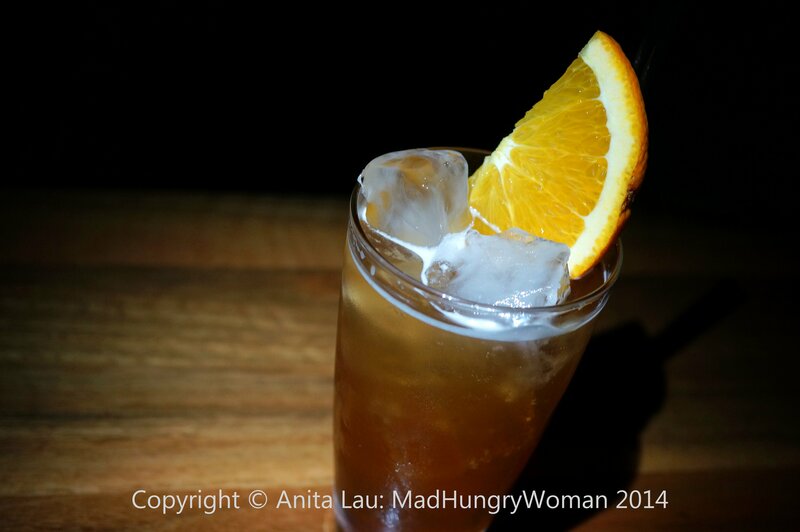 The perfect pairings of salty and tart is simply outstanding. 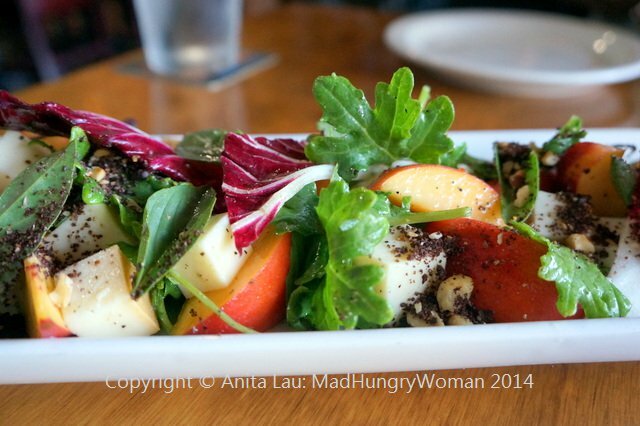 I suggest you eat this meal from light to heavy, although, the salads and fish dishes make for the perfect palate cleanser in between the heavier options. 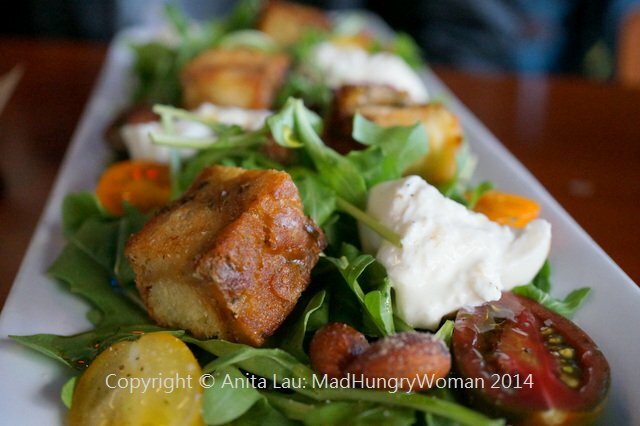 I just prefer to not cloud my mouth with the richer foods before I eat salad and fish. 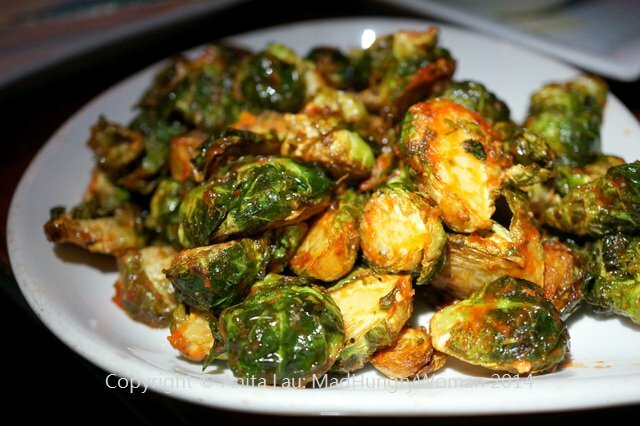 I hope you will visit Tavern on 2 and check out what Chef Frank is doing. I always know I’m going to be highly satisfied whenever I leave a meal that he has prepared. Two years ago, I was looking for a spot to dine with an out-of-town visitor who was staying nearby. After consulting Yelp, I decided on The Globe in Garden Grove and we ventured out here for dinner. I remember some of the food being good, some not, but what blew me away was the incredible variety of Belgian beers they had both on tap and in bottles. Fast forward to today. 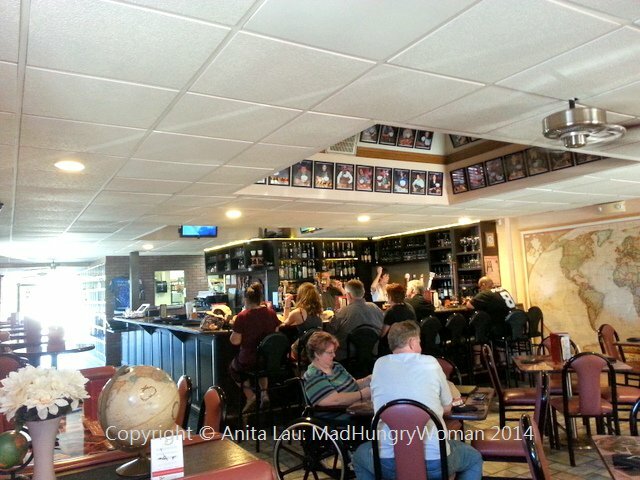 A friend of ours invited us to visit the restaurant, now renamed The Globe – Belgian Gastropub. I remember the restaurant well, especially the husband and wife team who own this place. The new chef on board, Chef Christophe was formerly at Encore Dinner Theatre in Tustin. We ordered a round of beers. On the day of our visit, the Chimay Première Red the exclusive trappist Belgium beer on tap for the first time in 350 years was available and some of us indulged in this very smooth and distinctively aromatic beer for the first time in our lives. I, on the other hand, couldn’t make up my mind so I opted for a flight of the dark beers on offer. Of course, I am not able to just drink beers. Food is always on the agenda and there are some stellar items on the menu to accompany your drinks with. 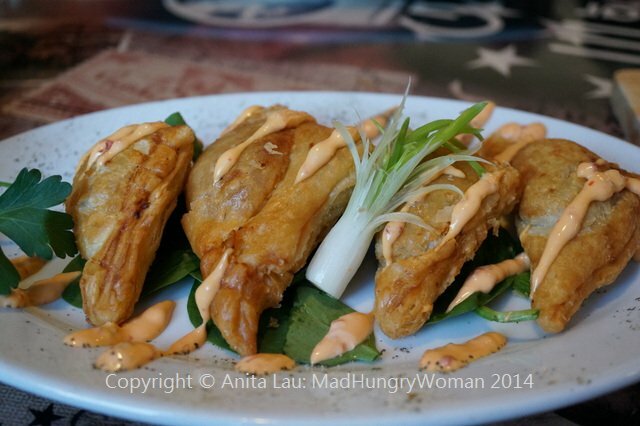 Chorizo Empanadas ($8.95) are Pamplona chorizo stuffed inside puff pastry. Very flavorful, but a tad greasy for me. 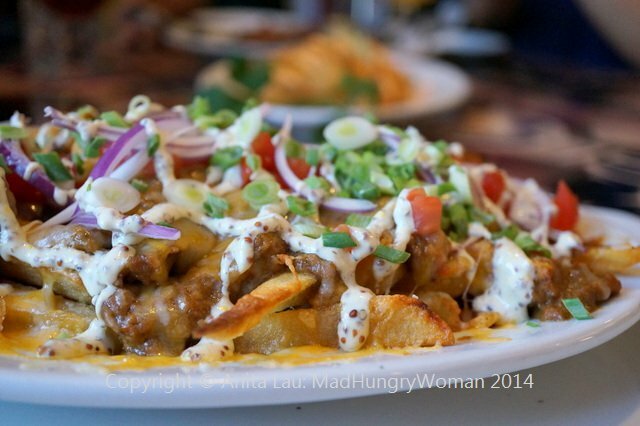 Everyone loved Belgian Nachos ($10.95), using hand cut, double fried fries instead of tortilla chips. Topped with shredded beer beef, cream of mustard, sour cream, jack and cheddar cheeses and salsa fresca, this is a perfect dish to sop up all the beers you’re about to consume. 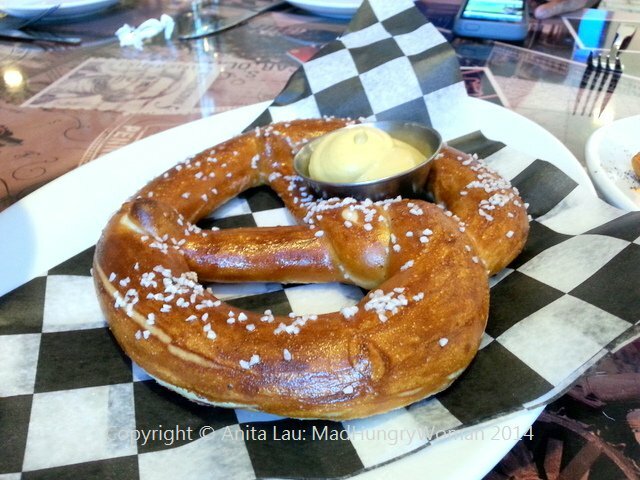 I couldn’t get enough of the house-made Bavarian Pretzel ($4.95). 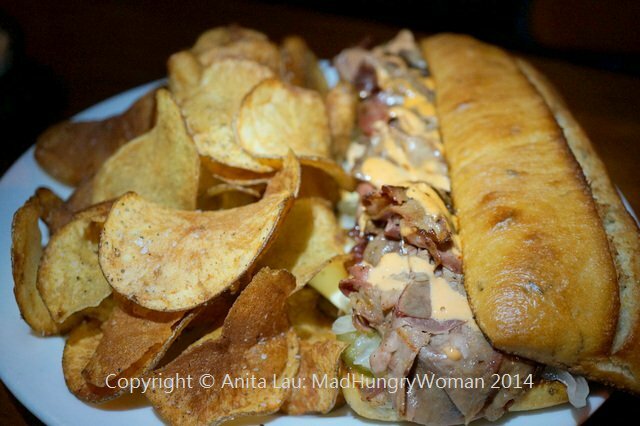 The spicy Dijon mustard was a huge hit with everyone and we fought over the pretzel. In the end, we had to order another! This is not something I’m happy about sharing. I think on my next visit, I’m having one on my own. Moving on to entrees, Steak Frites ($19.95) using outside skirt steak was a little under-done (we ordered medium rare). Even so, it was seasoned well and I liked how they served it with a side of sauteed vegetables. 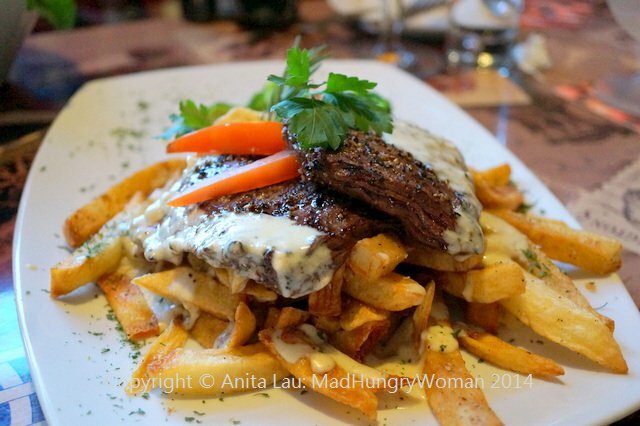 You have a choice of two different sauces, we selected the gorgonzola cream cheese over Belgian frites. 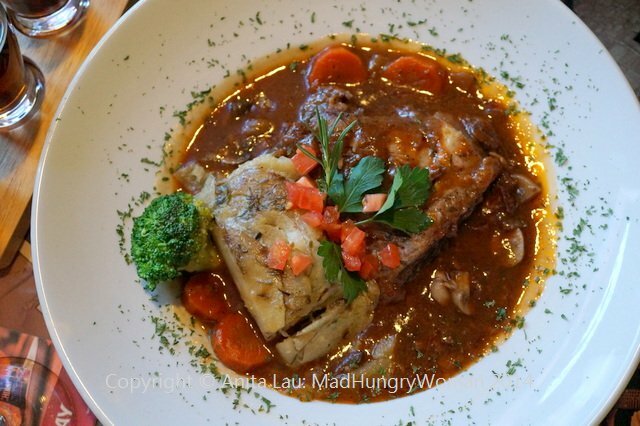 I love coq au vin so when I saw it on the menu, I knew we had to order it. Coq au Vin ($16.95) is described as braised chicken with caramelized onions, bacon, mushroom medley in red wine reduction on the menu. I would have liked a little more wine in the sauce but overall it was still good. The accompanying potato dauphinoise was delicious. Jambalaya Pasta ($16.95) though, was the one everyone agreed was absolutely delicious, Sauteed shrimp, black mussels, spicy chorizo and mushrooms are tossed together in a tomato cream sauce — light cream — and it was a stellar choice. I would totally order this again! There is no place in Orange County quite like this. 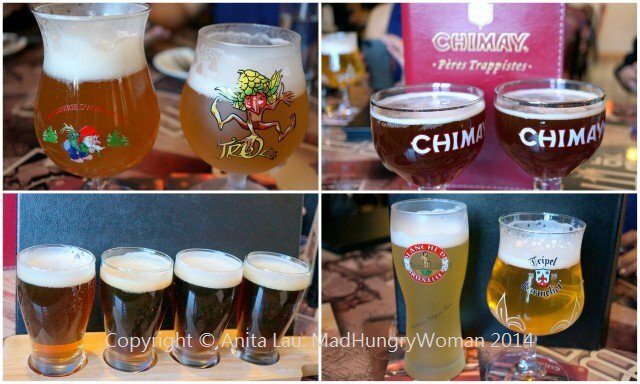 You won’t find a more stellar Belgian beer list anywhere else, and now, the food has stepped up to make this a very worthy destination to grab that bite as well while enjoying the brew. I met a new friend at the end of last year, at a holiday party, and we had been trying to organize a meal together. 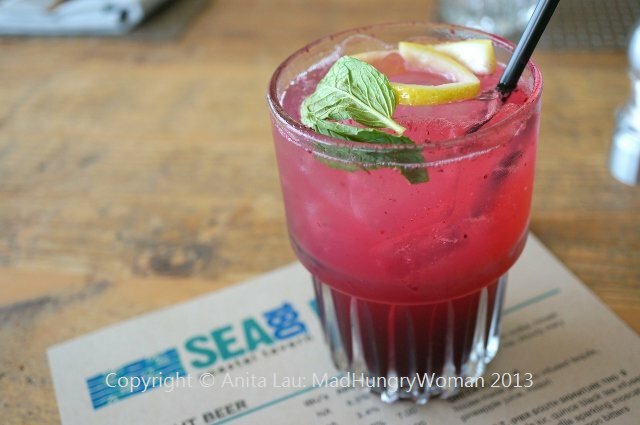 A new restaurant, Sea 180º Coastal Tavern, was suggested and I made my way down to San Diego to find al fresco dining at its best, right on the beach! 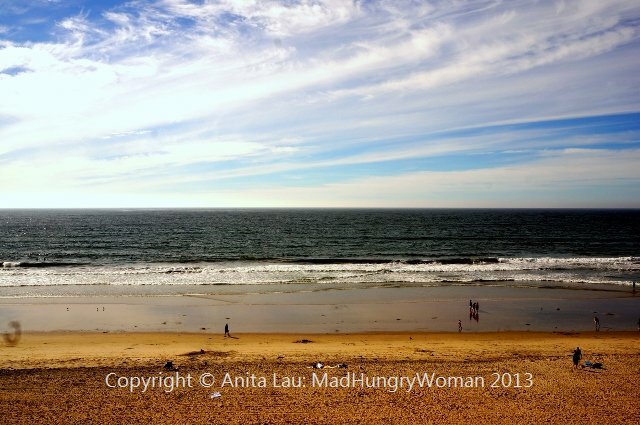 There is nothing better than that on a clear day in southern California, and although I don’t like sitting directly in the sun, I like the visuals of the ocean, boats and the horizon in a distance. 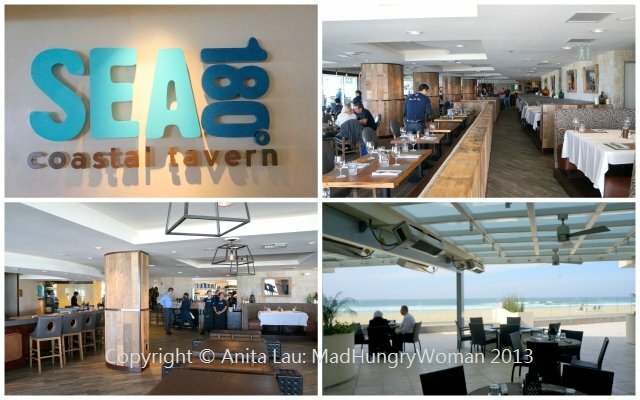 I was surprised to find Sea 180º Coastal Tavern located within the Autograph Collection by Marriott in Imperial Beach, but this boutique hotel offers the privacy of a secluded beach with unobstructed views of the ocean, not easily found in tourist-ridden San Diego. The restaurant reminds me of a chic gastropub, but the only difference is, the ocean is right outside. Every single table offers that gorgeous view, so regardless of where you’re sitting, you won’t miss out. 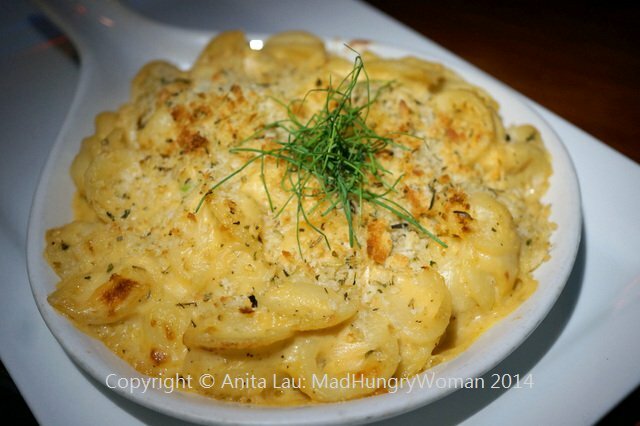 The menu is also well represented by offerings that appeals to a wide variety of palates. Since it was lunch, I didn’t look at the wine list, but the Ginger Swizzle ($5) was a refreshing light ginger beer infused with pomegranate and blueberry syrup and bitters. The first thing that caught everyone’s eye was Huevos “Diablos” Truffled Duck Eggs ($9.95). 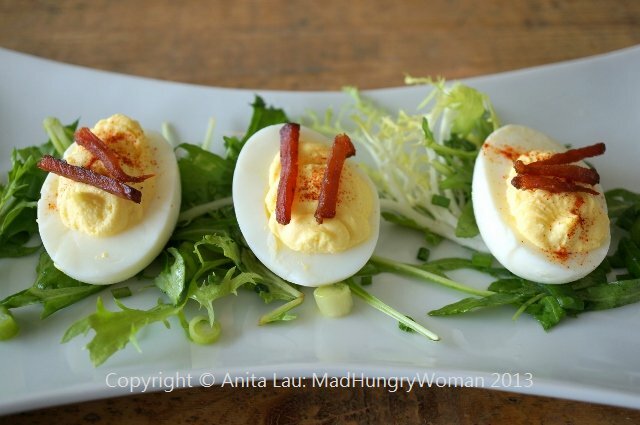 I didn’t realize it was a deviled egg-style dish utilizing duck eggs as its base until it hit the table. Topped with crispy house smoked ham and chives on a bed of frisee lettuce, these eggs were creamy with well textured egg whites. 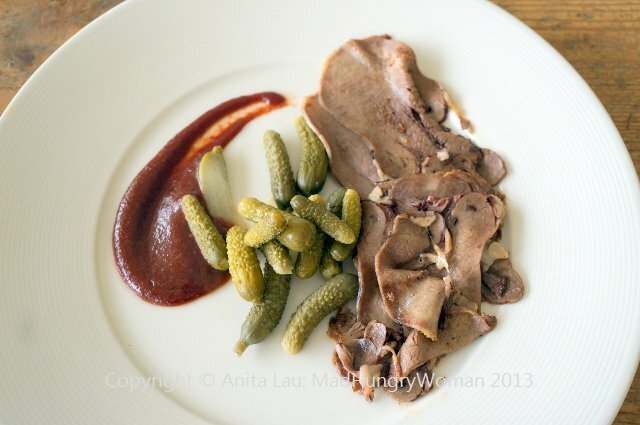 Another item which stood out was Smoked Beef Tongue ($12.95). I wasn’t sure what to expect, but it was thinly sliced, served warm with cherry mustard and cornichons on the side. The tongue is smoked in-house and even though the presentation could have been a little better, it was tender with lovely smoky aromas. Hearth Baked Clam Flat Bread ($11.95) is assembled “white” style topped with clams, oyster mushrooms and garlic. The chewy base is good and I liked how it was different to the familiar tomato based toppings usually found on flatbreads. 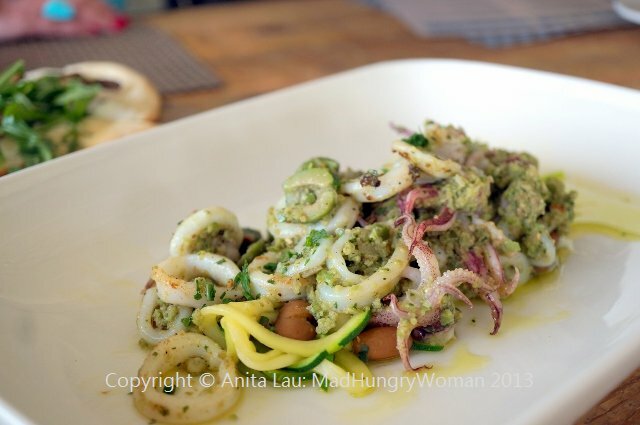 Green Olive Pesto Calamari ($9.95) was outstanding. Both the rings and tentacles were perfectly cooked without a hint of toughness. 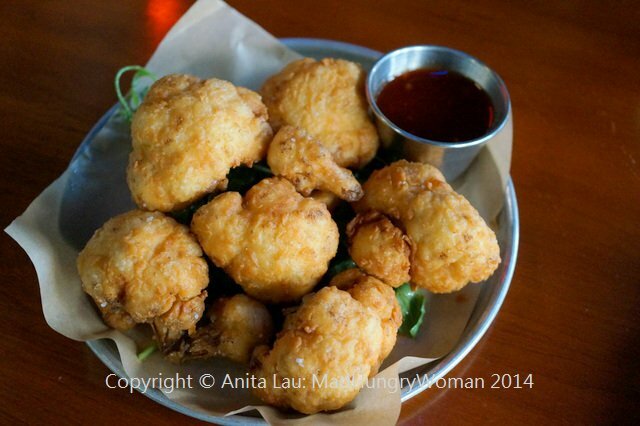 We all agreed that calamari served au naturel without being fried was the best way to go. The savory sauce adhered to the zucchini noodles very well making it an all around delicious item — I wish I didn’t have to share this! 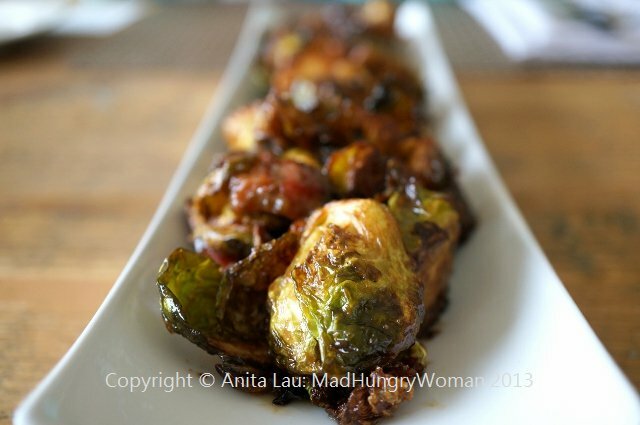 The Fired Roasted Brussels Sprouts ($8.95) was a huge hit. Tossed in a balsamic glaze and bits of house smoked crispy ham, the hints of sweetness paired with saltiness was too enticing on the palate. We couldn’t stop eating it. I chuckled when I saw Duck “Canarditas” ($15.95) and thought it was such a smart name for it — ‘canard’ is duck in French. 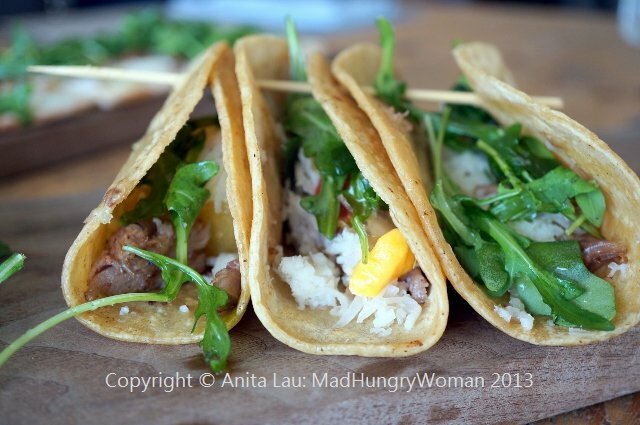 Caramelized onions, pineapple salsa, aged goat cheese all come together to make this a gourmet taco indeed. Salty with hints of sweet and tart were perfect accompaniments for the duck. 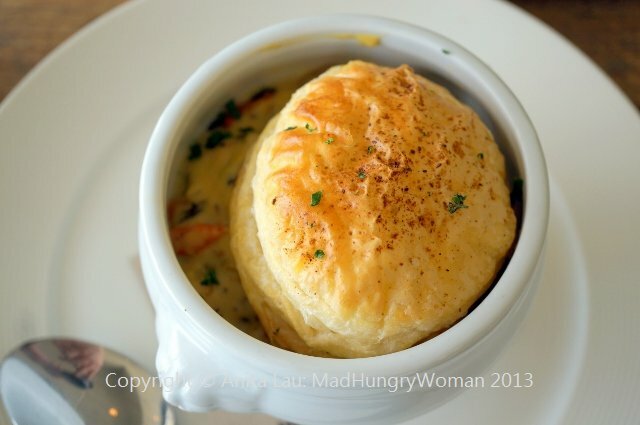 Seafood Pot Pie ($12.95) was not your traditional pot pie. Comprising a blend of fresh seafood including fish, shrimp and scallops, there is also carrots, fennel, salsify and saffron, all topped off with an Old Bay spiced crust. If you’re looking for something different, or just to escape from it all, come for a meal and pretend you’re on vacation for a few hours. Diners receive 3 hours complimentary parking underneath the hotel with validation.